When we talk about Social Media, it's Facebook, Twitter, Instagram, YouTube, so on and so forth. Most of us just want to share the best moments of their life online, but only a few of us know the value of social media. Just how valuable is your social media profile? It is your gateway to fame - 15 seconds is all it takes for someone to notice others, so what if those 15 minutes were spent on doing brilliantly crazy things, or saying things that hit the guts and make sense? It is your resume - Even if you're not in the world's largest professional social networking site, your social media profile is your resume. Nowadays, recruiters add this into the things they need to see before getting hired (or fired). Companies use it; heck, even the government uses it - You can connect directly to different agencies or companies which has their own Facebook or Twitter accounts. The government may even ask for your social media handles - In the United States, the Department of Homeland Security wants to add a social media field for those who are coming in their country, though this has yet to be discussed; and it is optional, according to the US DHS. You can check its value online - There are services online that checks the worth of your social media handles, and most of them are free (though be wary of some of them, and focus closely at what their systems do). There's just a lot of reasons why social media is valuable, and if these don't convince you, what will? 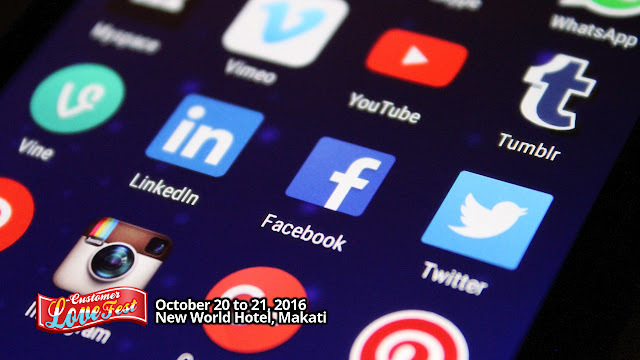 Get to know the latest updates and insights on Customer Love at the Customer LoveFest, which will happen at the New World Makati Hotel this October 20 and 21, 2016. The Customer Love Fest will feature key resource speakers and the latest concepts in Customer Experience Management, Customer Relationship Management, and Customer Loyalty and Rewards. Join in on the fun and don't be left out. This event is produced and organized by Ex-Link Management and Marketing Services Corporation, a business organizer in the Philippines. To be part of the Customer Love Fest, call telephone numbers 633-01-53, 643-38-87, mobile number 0920-981-4376 or send an email at info@exlinkevents.com. Ex-Link Events is also on Facebook, Twitter and Instagram.